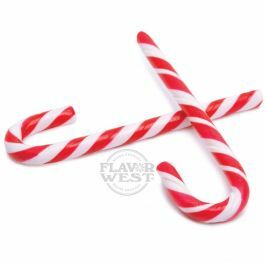 The most predominant flavor is combined with peppermint flavor to deliver candy cane flavor uniqueness and stands out in any treats Type: Candy Cane Water Soluble Flavoring. Ingredients: Natural and Artificial Flavoring and Propylene Glycol. USP Kosher Grade Flavoring. Usage Rate: 15-20% for E-use. Flavor suitability: Desserts, pastries and baked treats, yogurt, ice cream, candy and more. Specific Gravity: 1.04 No Refunds on Flavoring. i've been vaping this flavour for about 4 months now and it IS my favourite flavor so this review does have some bias. if you like sweet peppermint then you will love this flavor it tastes just like the name like a candy cane.